Between the Emperor and the Gladiator, one would think there isn’t room for another warrior on the world stage. And yet out of the ashes of a difficult injury prone career, the dark horse has scripted a comeback! Perhaps it wasn’t as popular a comeback as Federer and Nadal but it is no less a story of perseverance and hard work.He was hailed as the tennis’ upset specialist in the US Open 2009 beating both Nadal and Federer at the top of their respective game. What followed, however, was a wrist injury in 2010 followed by 4 surgeries and murmurs of an early retirement. The 2016 Wimbledon was the rise of the phoenix and while the world was still looking at the indomitable rise of Djokovic, Wawrinka (even in his loss) acknowledged how happy the world of tennis was to see the dark horse rise again. Perhaps it was the love of the Latino community in the US Open or the love of the millions in Argentina praying for one man, the quarter final loss at the tournament against Wawrinka was a historic moment the sport would cherish for a long time. 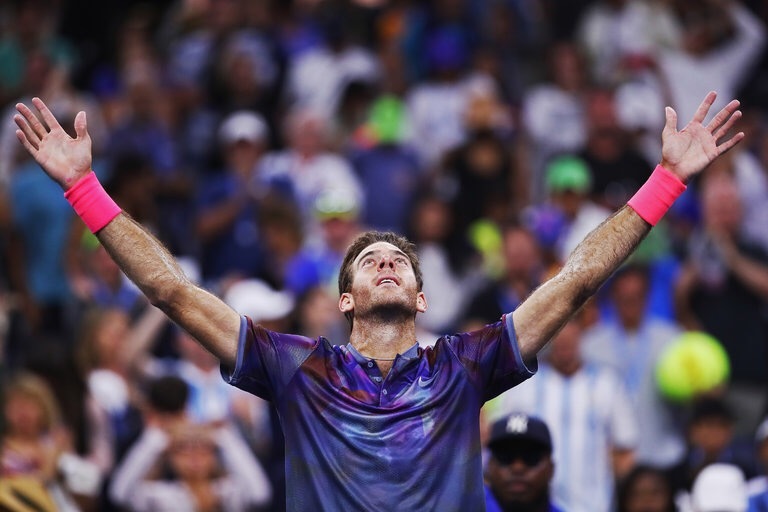 The crowd celebrated his return to the echelons with chants of “Delpo, Delpo” as a teary eyed Del Potro served for his last game of the match. He missed this, who wouldn’t? The story of his return is the end of a long love story in which the fans of the game have played the most important part. Unlike the greats like Federer and Rafa who have managed to for a large part motivate themselves to script a fairy tale comeback, Del Potro’s story of comeback all centers on the love of the crowd and the love of the game. We were all in tears in that US Open quarters, because we had willed our Dark Horse back to life and here he was for another fight. While 2017 was fraught with back injuries and personal losses, here he is scripting a similar 2009 story. Just as the two giants of the game have scripted a comeback meant for the history books, I would spare a thought for the heart of a man whose career was stolen from him and yet he stands on a court strewn with his tears and those of his beloved fans with a quiet smile on his face. For all my love for Rafa, I wouldn’t be entirely heartbroken if this Dark Horse wins. I eagerly await a semifinal between the raging bull and the hungry heart. It was a resurrection that left millions of his fans in tears. And when Roland Garros officials played the throwback video during the award ceremony, for a second, I was my 19 years old self watching a fellow 19 year old win French Open for the first time. Friends have asked me, why I take his game so personally and why I have over the years defended his every game with such ferocity. Perhaps it’s because we share the same birth year or maybe, I, like the many million fans, was smitten by the passion and grit that had suddenly spring on to the court in 2005. It was an year when Federer’s machine like precision was already dominating the scene and comparison was inevitable. Soon the world was divided between those who liked the graceful aggression of a quiet, polite young Swiss and those who preferred the boxer-like demeanor of a raging bull from Spain. The traditional and classy courts of Wimbledon preferred the company of Roger’s quiet smiles and the loud colourful French crowd preferred the iconic raised fist pumps from a brightly dresses Rafa. Everything about Nadal screamed an aversion to convention. From his Capri pants (which had to be reduced in length for the Wimbledon – because – you know – the British!) to the sleeveless T-shirts showing off the flexed arm powering the forehand winners slaying scores of young women, from his obsession with his bottles on court to the countless pre-serve dribbling which tested the patience of his breathless opponents. He has often wondered out loud whether the success came too soon. He was barely speaking English in those years, but his body language spoke for him. He was here to conquer the court and any flaws that came in the way would be dealt with his trademark killer instinct. The real prize for the world, however, was the 2008-09 season. He has often spoken about how little he remembers of that final set (6-0) against Federer at the 2008 French Open final. He was in the ever elusive “zone”, a place of complete invincibility few champions have reached in the past. For most Rafa vs Roger fans, this match was the turning point, the real coronation. He had come a long way since 2005, adapting his game, hitting flatter forehand and more precise top spins. Wimbledon – suddenly looked plausible. To all of his critics, this season was the answer, he wasn’t just content doing well on his favorite surface. He wanted to prove to himself and the world that while clay court was his kingdom, he could conquer any unknown land he wanted to. This was the year the soldier became the Gladiator. The Wimbledon 2008 final will go down in history as the greatest tennis match ever played. It was won not by talent, but with grit, hardwork and an unending love for the game. Amid rains, sweat and tears, the greatest player in the history of tennis admitted defeat to one man’s unconditional devotion to the game. It is true his game was best suited for the dusty surface, a court that crowned him king at such a young age. This has been his castle and since 2005 when he first entered the hallowed grounds, he has never let anyone forget that. There were 2 blips in the journey, but they were exactly that, small kinks in an impenetrable armor. But he took the loss like he takes the victory, with his usual air of humility. Working with the same coach since the age of 3, he has never forgotten his roots (uncle Toni wouldn’t let even if he tried). A tournament in Chennai in 2007 inspired him to set up his own foundation back home to help underprivileged kids in Spain. “I want a legacy beyond tennis”, he said. “He’s writing checks his body can’t cash.” Agassi had said of Rafa back in 2005 after losing to him. We all know Agassi had never been a gracious loser so everyone took the comments with a pinch of salt. But, in 2014, the threat of a burn out became real. After injuries to left shoulder, left foot, left arm, tendinitis in both knees, both wrists, back trouble (the list could go on), he looked all but broken in 2016 French Open press conference. He was dropping out after a near comback story cruising through 2 rounds with ease. He conceded that the levels of tennis the world was used to from him were perhaps a thing of the past. It is the only time I saw him truly defeated and his opponent was no one but his own body. The fights and bouts had taken their toll and the battle scars were no longer just battle scars they were his demons. Mind you, 29 isn’t a bad age to call it quits (Borg did it at 27), he had achieved far more than his critics had written him out for. “I can’t control how I play. I want to keep getting better. And the most important part is the head.” – he had said in 2009 in an interview to New York Times. And ironic as it may seem, for all the macho bruised hero appearance and his bulging biceps, it is his mind that is his biggest strength. It is this strength that brought him back to the finals of Aus Open early this year and led to the return to his beloved kingdom last week. He was back in the zone in the last set. There were shots where Wawrinka would just look at Rafa in disbelief and proceed back to his corner resigned to his fate. 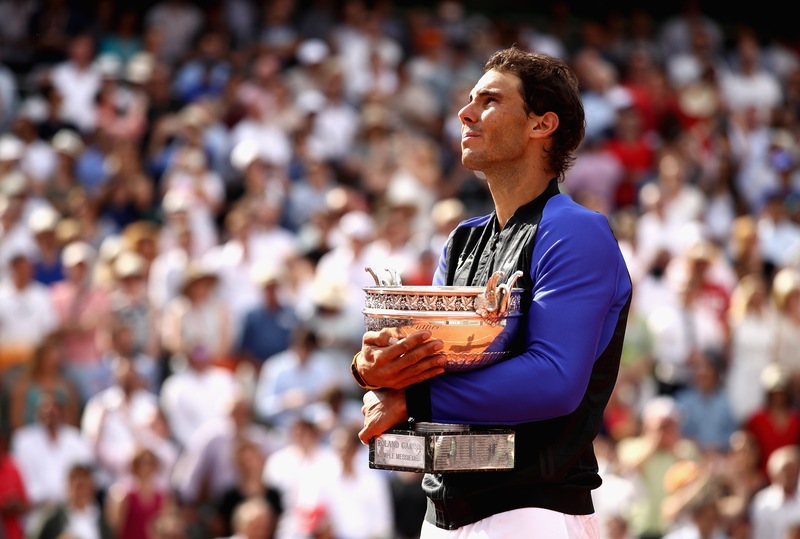 The Resurrection of Rafa is a beautiful poetry of resilience and endurance. And yes I agree with Fedex fans that he is the greatest tennis player of all time but Rafa – is the greatest fighter of the sport of all time and perhaps his good friend Roger would be the first one to grant him the title!